The skin's tendency to sunburn rather than tan is a major risk factor for skin cancer. 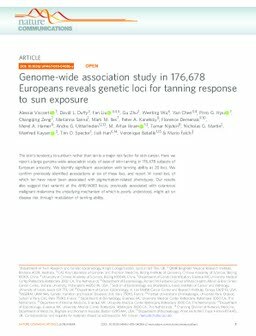 Here we report a large genome-wide association study of ease of skin tanning in 176,678 subjects of European ancestry. We identify significant association with tanning ability at 20 loci. We confirm previously identified associations at six of these loci, and report 14 novel loci, of which ten have never been associated with pigmentation-related phenotypes. Our results also suggest that variants at the AHR/AGR3 locus, previously associated with cutaneous malignant melanoma the underlying mechanism of which is poorly understood, might act on disease risk through modulation of tanning ability.